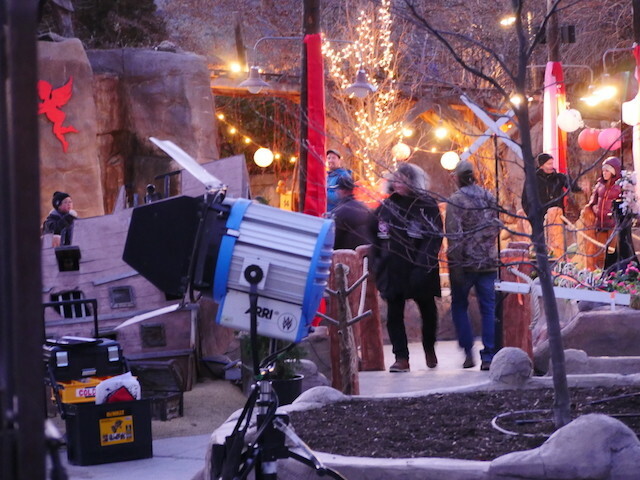 Film crews with the Hallmark Channel wrapped up production in the South Okanagan Wednesday at Locolanding with a “Valentine’s Day” finale. Crews have spent the last nine days in the area at vineyards in Naramata, Summerland and Osoyoos shooting the third installment of the In the Vineyard feature-film series. Wedding In the Vineyard stars Rachael Leigh Cook and Brendan Penny. It follows the same characters as the previous films Summer In the Vineyard and Autumn In the Vineyard—both which were also filmed in the South Okanagan. “The audience tends to love them (the series),” said producer Trevor McWhinney, explaining the door is open for more In the Vineyard movies down the road. The movie is themed around Valentine’s Day—around when it will be released on the Hallmark Channel next year—and Locolanding was decked out in decorations for the occasion. “The scene here is a double date and we start to learn about the incompatibilities of our lead characters and it puts it into question if the pairing is really what they want,” McWhinney said. The film is again set in a fictional area within California’s Napa Valley.